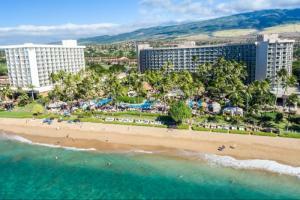 On Kaanapali Beach, next to Whalers Village, approximately 45 minutes from Kahului Airport, 10 minutes from West Maui airport. Colonnade Café, SeaDogs, Relish Burger Bistro, The Relish Oceanside, Wailele Polynesian Luau and In-Room Dining. Volcano Trips, Helicopter Tours, Hana Adventures, Lahaina Town, Sailing Trips, Whaler's Village Shopping Center, Luau, Hike Maui, Golf, Snorkeling, Scuba, Horseback Riding, Windsurfing and Tennis Court.